P&O Ferries Hull, previously called North Sea Ferries sail daily from Hull to Rotterdam and Zeebrugge. As well as taking passengers with vehicles, North Sea Ferries are also famous for their minicruises to Amsterdam, Rotterdam, and Bruges. We love the North Sea Ferries from Hull and sail on them regularly – usually for a relaxing weekend in Amsterdam or Bruges. Use the search above to check the fares and book securely online. Any questions about North Sea Ferries? Pop us an email let us know. Choose between travelling as a foot passenger or with a vehicle and if you book meals (breakfast, dinner, or both) in advance it’s cheaper than paying onboard. Foot passengers can purchase coach transfers from Rotterdam port to Rotterdam Central or Amsterdam (ferries to Rotterdam), or Bruges (ferries to Zeebrugge). There are two ferries on each route – Hull to Rotterdam is serviced by the Pride of Hull and Pride of Rotterdam whilst Hull to Zeebrugge has the Pride of York and Pride of Bruges. Onboard each ferry is a great range of facilities – in part it’s these that have made the Hull North Sea Ferries so popular. You will find restaurants, cinemas, a well-stocked shop, a casino and of course a choice of bars. In the show lounge there is usually surprisingly good live entertainment to enjoy. P&O Ferries daily service from Hull to Rotterdam is one of the most popular ferry routes from the UK to the continent. The ferry departs from Hull docks at 9pm and arrives in Rotterdam (Europoort) the following morning around 8am – a total journey time of around 11hours. This is plenty of time to relax, explore, and enjoy the onboard facilities and entertainment. All passengers have an ensuite cabin (toilet and shower, with towels provided) meaning you can get a great nights sleep to arrive in Rotterdam relaxed and refreshed. Cabin choices range from the most economical Standard inside or outside (with a sea view porthole) cabins, through the slightly larger Premier inside our outside cabins to the luxurious Club Cabins. The North Sea Ferry to Rotterdam is perfect for a day trip to Amsterdam or as a gateway to a longer journey into the rest of Holland and the continent. As well as the ever popular Hull to Rotterdam route, P&O also still offer the Hull to Zeebrugge North Sea Ferries. Perfect for a romantic weekend in Bruges (a fantastic city we’ve visited often) or as an entry point to the continent for a longer holiday, Zeebrugge is one of Europe’s premier ports. The ferry departs Hull in the early evening (through a pretty impressive bit of manoeuvring through a lock) and arrives at Zeebrugge the following morning. As with the Rotterdam ferry, there is plenty of entertainment onboard for both adults and kids. There is a choice of cabins ranging from Standard (still with ensuite shower and toilet – towels provided) through slightly larger Premier cabins to the Club class cabins for those who want a bit of North Sea luxury! This route makes a perfect alternative for travellers from the North of the UK to avoid the long drive south to the Dover to Calais ports. Perfect for a long weekend in Bruges, or as a gateway to France and Germany the North Sea ferry from Hull to Zeebrugge carries you in style overnight from Hull to arrive refreshed in the morning in Zeebrugge. With a range of facilities on board for both adults and children, the ferry makes an ideal alternative to the long drive south for the Channel ferries. These are the basic cabins for passengers looking for a low cost North Sea Ferry. All standard cabins have two or four bunk beds and ensuite with shower and w.c. Towels are provided. Choose between an inside cabin (the cheapest option) or an outside cabin which has a porthole for a sea view. Hull to Rotterdam: Located throughout the ship, thee 2 or 5 berth Premier ensuite cabins have beds or bunks and a choice of either inside or outside with a sea view. Ensuite shower and w.c. with towels provided. Hull to Zeebrugge: Premier are cabins located on green deck, with a choice of either inside or outside with a sea view. Available with 2, 4 or 5 bunks. All have ensuite with w.c. and shower. Towels provided. For those looking for a little luxury on their North Sea Ferries crossing, then Club cabins are just the ticket. All Club cabins have a sea view and are located in a quieter part of the ship. Plus there’s extras including colour TV, fresh fruit, and tea and coffee making facilities. 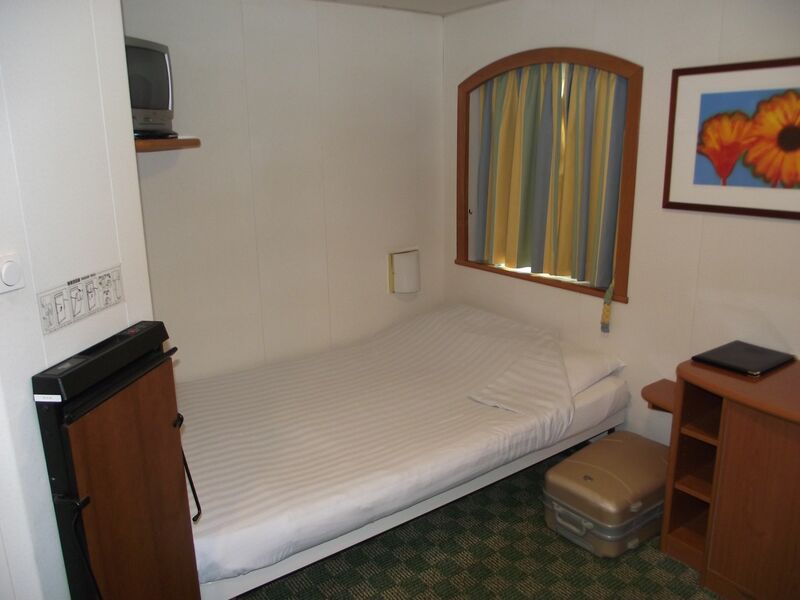 Some recent shots of a Club cabin on the North Sea ferry Hull to Zeebrugge are shown below.